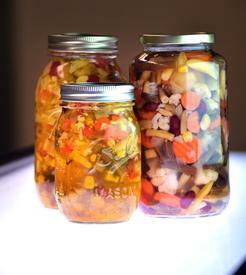 Chow-chow is Pennsylvania Dutch's pickled version of chopped salad! Long before the days of refrigeration, cooks chopped whatever was fresh and covered it with a sweet-sour syrup. Think of it as Pennsylvania Dutch chopped salad — but pickled, of course. These days, chow-chow is a year-round food, served as a side dish, a condiment on burgers, a salad topping or sometimes straight out of the Mason jar. Doris and Owen Roberts picked up two quarts of chow-chow at Root’s Country Market this week to restock the pantry in their Landisville home. She likes to serve it as a salad with a hot meal, while he likes a bowl of it with a sandwich.